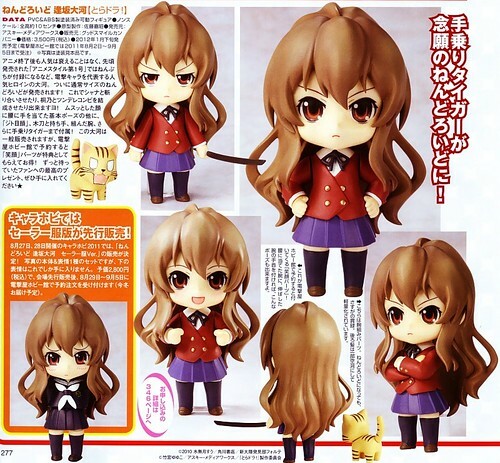 Nendoroid Info in Latest Hobby Magazine Scans (July 2011): Aisaka Taiga Revealed! Nendoroid Petit Hoshino Ruri is now completely colored, since the last time we spotted her. The popular twintail heroine from Kidou Senkan Nadeshiko (a.k.a Martian Successor Nadesico) is going to be bundled with the Anime Style vol. 4 magazine and scheduled for release on October with a price tag of 1575 Yen. Meanwhile, Nendoroid Hercule Barton (Elly) from Tantei Opera Milky Holmes has been completely revealed as well. Three expressions, two separate bodies, and two caps (among usual optional body parts) are all she will bring in the package. No exact release date for her though, but the price has been announced: 3500 Yen. Is that school uniform ver. is a standard nendoroid?